Hurry up and wait, it’s the Charmed mantra. Once again we’re treated to a too-fast battle and a cliffhanger ending. But the touching moments helped bring us along. When that’s gone, what are we left with? We got some heart-to-heart talks throughout the issue, first between Leo and Piper, then between Phoebe and Cole. Leo has been relegated to hanging out in Cupid’s Temple to keep watch over the children. He is indeed missing out on having powers, since he can’t join the fight as he wants, but he’s serving a worthwhile purpose. By keeping the children hidden and safe, the rest of the family can concentrate on the fight ahead of them. Still, I miss the old powered-up Leo. Maybe we’ll see his return in the future. Phoebe and Cole’s conversations together endeared Cole to me, as I have been gaining my appreciation for him once again. He misses Phoebe, and can’t help but think about the what-ifs. But their time has come and gone. As long as she’s happy, he’s happy for her, even if he cannot be the one by her side. This was specific emotional manipulation of the reader, though, because of what is to come. But more on that later. 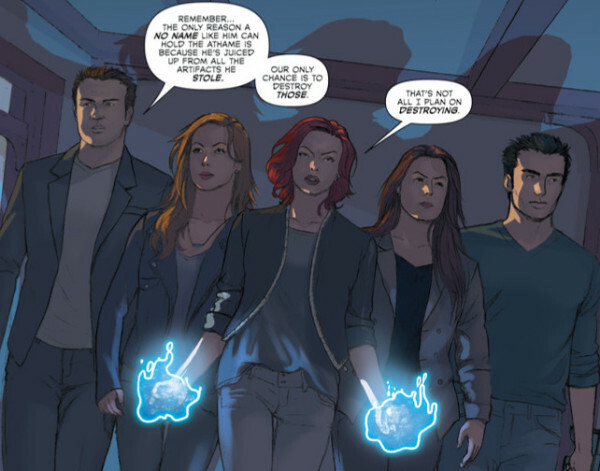 The story centered around Valen and his efforts to destroy the Charmed Ones. Starting off the issue, he uses new charge Aidel to get to them, by tying up his parents and attacking him when he arrives home. The Charmed Ones are alerted to his crimes through Prue’s emergency alarm system in the middle of the night. They see that Valen has a knife to Aidel’s throat, and will kill him if they don’t come to the cemetery in thirty minutes. So, the group heads off, looking powered-up and ready for a fight. The showdown itself went a bit too quick for me. Aidel tries to help the group, when they are attacked, but all he gets is a mallet upside the head for his troubles. And then we end with the emotional manipulation bit, as mentioned before. Just as Coop is about to get stabbed, Cole pushes him out of the way and gets a blade to the chest. Now he’s dying, we’re crying, and there’s a month before we find out how it all plays out. Poor Cole, so selfless in his seemingly last act.